A super walk on the hills and moors above North Stainmore and the Eden valley including a visit to the summits of Great Knipe and Iron Band. It is probably fair to say that even when I go walking with other people it is usually me that comes up with the walk route. This walk was a rare exception as my friend Paul, not only discovered the roadside parking at Banks Gate, but also came up with the outline for this route. The twin aims of the walk were to visit Great Knipe and Iron Band, two summits north of the Stainmore Gap. From the old road at Banks Gate we took an enclosed track heading north-east from Slapestone. Without gaining much height we were very quickly able to enjoy fine retrospective views over the Eden valley. At the top of the track we made a detour to the left to visit Plucka Tarn. To reach this we had to very carefully cross a wooden ladder stile that has clearly seen better days. Plucka Tarn proved to be a nice little sheet of water with a good view of Little Fell. Retracing our steps we then took a permissive path along the modest edge of High Crag. As the crag faded we continued in a more south-easterly direction with Great Knipe now up above us to the left. Without making a direct ascent we climbed up alongside Slapestone Sike to then double back up to the waiting trig point on Great Knipe. My only previous visit to Great Knipe had been over eight years before. On that occasion I’d contrived to leave my camera at home and had to make do with the poor quality pictures of a cheap phone. It was nice then to finally return and get some pictures with a decent camera. From Great Knipe we basically followed the wall in a generally north-west direction over Little Knipe, Long Band and High Edge. Not long afterwards we crossed the bridleway from North Stainmore to Baldersdale. At this point we passed a couple walkers who told us that we might see a little dog which they had spotted running around on its own. Sure enough a couple of minutes later a little white terrier with a black and brown face appeared. At first the dog circled us, drawing nearer and nearer but without coming right up to us. As we continued on our way it started to follow us and before we knew it we had a new companion. The little dog’s obvious pleasure in exploring her surroundings led us to call her ‘Dora’. Despite our concern as to whether or not she was lost Dora herself didn’t seem distressed in the slightest. Continuing on the three of us eventually reached the bridleway from North Stainmore to Slate Quarry Moss. Turning right on this we followed the bridleway up to the remains of the old mine workings. From there it was then a pathless plod up on to Iron Band. 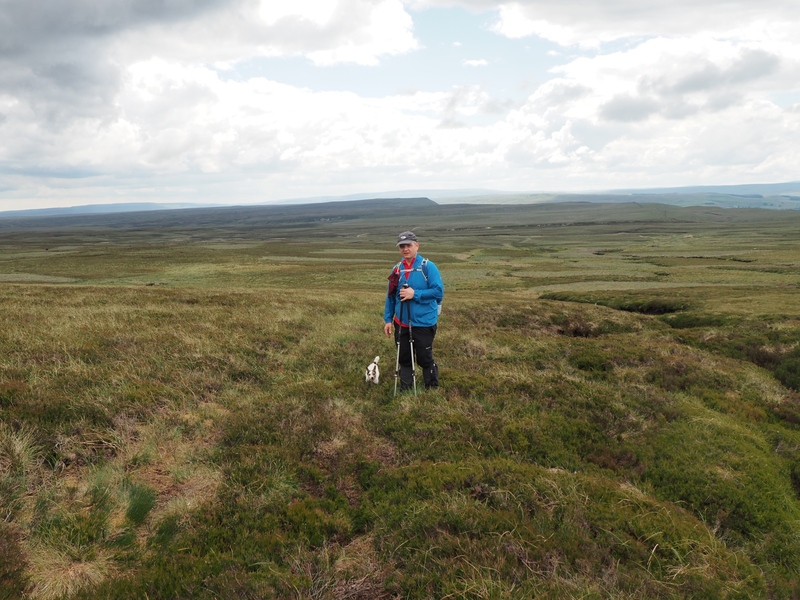 After visiting the summit, which was marked by a grouse feeding station, we went in search of the Ordnance Survey ‘curry stool’ which is supposed to be situated a hundred metres of so west of the summit. Despite having the grid reference we were unable to locate it. Hopefully one day it will be third time lucky. Descending south-west we found the top of the enclosed track that continues in the same direction down to the road. Half way down we stopped for a bite to eat. For a short time we thought Dora had left us but just as we got ready to set off again she re-appeared. Continuing on down to the road we turned left on the B6276 for a short way before turning left again on the minor lane running below Windmore End. At a bend in the road we took a path across pastures heading to the road end at Spurrigg. We realised we were now not far below where we’d originally been joined by Dora. By this time we’d already been discussing for sometime what to do with her as we certainly couldn’t leave her. While I’d have loved to have taken her home we first had to make sure she wasn’t local. We first tried Borrowdale House but that proved to be a holiday let. Walking back up to Spurrigg End there was no one home. Just as we were leaving the latter the owners arrived in their car. This was a fortuitous stroke of luck as they recognised the dog. Apparently ‘Dora’ belonged to the owners of the house at Long Crag and often escaped out on her own. They kindly offered to take Dora home so it was time to say our goodbyes to our canine companion. It was a massive relief to know we’d found where she lived but at the same time I couldn’t help feeling disappointed that I wouldn’t see her again. The final section of the walk was a simple case of following a bridleway back to Banks Gate. Along the way we passed Clumpstone House and Ledderhowe. Also of interest was a modest buttercup covered bump that was once the site of a Roman signal station. Although there were long stretches of pathless walking we thoroughly enjoyed this walk. As good as the views were though there is one thing that I will forever remember about this walk and that is the delightful little dog we called Dora.